There is an almost endless variety of puppets you can make with easy-to-find materials. And the good news is that most can be created from items found in your supply room or purchased inexpensively! We have lots of ideas for puppets, so this is part one in a series to help you create your own puppets for your Bible Club or any other Children's program. Some puppets require nothing more than a hand to operate them. Others can be used with a simple stage or puppet theater. If you don't have the means to build a permanent theater, hand puppets can be operated from behind a table by placing the table on its side, folding two legs and letting the table rest on the other two opened legs on the floor. 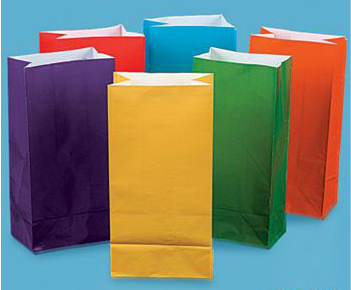 Today's post is about puppets you can make from paper bags. You can draw the entire animal face or Bible person's head on construction paper and then cut the face in half just above the mouth or just below the upper lip. To make the puppet "talk," attach half of the face to the top flap (formed by the bottom of the bag folded down) and the other half to the bag itself. Glue the eyes and nose to the top flap and the mouth shape to the bag itself to enable the "mouth" to move up and down. You may also simply draw a face on the bag or glue on wiggle eyes and other features. 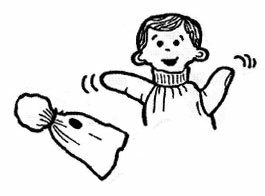 Place your hand inside the bag and make the puppet's head move by moving your fingers up and down. Open the bag and stuff it with crumpled newspaper to form the head. Crunch and mold it to form the shape you want (it should be about the size of a fist). Ears can be shaped from the bag or made from construction paper and stapled or glued onto the bag. Tie the bag loosely at the "neck" so a finger can be inserted into the head. Cut slits on the side of the bag so the child's little finger and thumb can stick out to form the puppet's hands. Paint or color facial features or add a yarn smile and wiggle eyes. Use fabric to tie around the neck to form clothes, or paint clothes onto the bag itself. Add any other trims you wish, such as yarn hair.